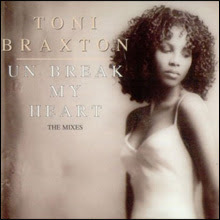 Had you ever heard the phrase "un-break my heart" before Toni Braxton sang it back in 1996? I'd wager not. Diane Warren's lyric isn't just original, it's economic - expressing in three words what lesser writers would have wasted an entire chorus on. Not every pop song can create a new idiom. Most don't even try. In fact, rock and pop lyrics have a very restricted vocabulary - around 2,000 words, compared to the 15,000 an average English speaker has stored in their head. Inevitably, some phrases get recycled. A select few become so inextricably woven into the fabric of pop culture that we forget they are UTTER BALLS. Here are five of the worst offenders. 1) "I hate to love you / I love to hate you"
Take a moment to marvel at this clever juxtaposition: How can you love someone and hate them at the same time? It's impossible! Or maybe it is not impossible: Have you ever been so mad at someone you could just kiss them? No, me neither. 2) "Baby, baby, baby, you got me going crazy"
Being in love can certainly make you feel giddy, elated, heightened, scared, soppy, jubilant, fulfilled. But not crazy. Crazy is sacrificing a goat, smearing yourself in its blood and going to Tesco for the groceries. Crazy is drawing fifty-five penises on your appraisal form and calling your boss "satan". Crazy is listening to the collected works of Olly Murs. If falling in love prompts any of those reactions... well, I can recommend a good doctor. 3) "I would do anything for you"
4) "I'm down on my knees, begging you please"
It's not just lyricists who are partial to this cliché. It's a popular trope in film and literature, too. It's the sort of thing artists like Usher imagine "real people" do, because they have no direct experience of genuine human interaction. 5) "Wave your hands in the air like you just don't care"
Why am I having to pretend not to care? Who in their right minds has serious concerns about waving their hands in the air? I suppose it might be a problem if you had particularly bad underarm sweat patches. And drivers should remain in control of their vehicles at all times. So why not change the lyric to "wave your hands in the air if you just don't care, but do try to consider the safety of others while your limbs are in a state of elevation, thank you and I hope you continue to enjoy the remainder of this song." There must be plenty more... Put your suggestions in the comments box, or send me a note on @mrdiscopop and I'll put together the rest of the top 10.